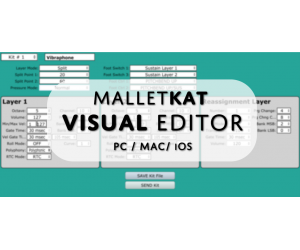 TrapKAT :: TrapKAT XL - Alternate Mode, Inc. The trapKAT XL features 24 playing surfaces with True FSR technology in a size and configuration that rivals an acoustic drum kit. With 10 large flat pads, 14 surrounding raised edge or "rim" pads and individual kick and hi-hat footpedal inputs, the trapKAT offers a complete electronic percussion system in single, compact instrument. Up to 16 sounds can be triggered per pad either Velocity Switched, Layered or Alternated. 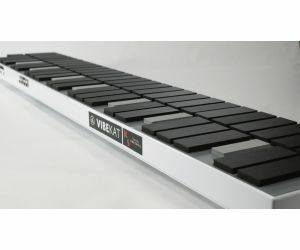 The trapKAT also features an array of built-in percussive and melodic "grooves" which can be completely controlled from the playing surface. This allows the trapKAT to generate additional percussion parts or complete rhythm section grooves for practicing or performing. 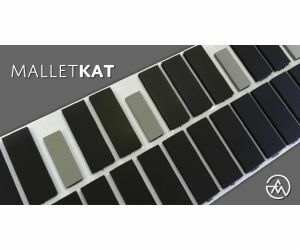 The trapKAT is the perfect solution for those who desire a comfortable and conventional layout with the power, flexibility and convenience of electronic percussion. Acoustic drum set players will feel right at home! The trapKAT XL weights only 14 pounds. The trapKAT XL is approximately 40” long and 17” high. The trapKAT XL uses individual 1/2” neoprene pads and 3/4” neoprene pads on the bumpers. The trapKAT XL sensors are extermely sensative and can recognize up to 128 different dynamic levels per pad. 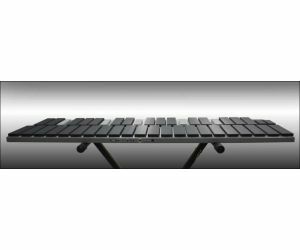 The TrapKAT XL is the perfect solution for those who desire a comfortable and conventional layout with the power, flexibility and convenience of electronic percussion.